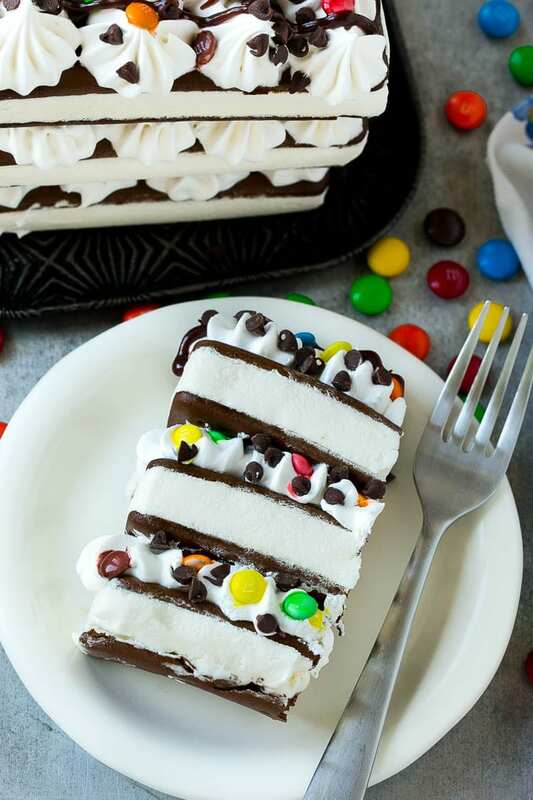 This ice cream sandwich cake is layers of ice cream sandwiches, whipped topping and candy, all stacked up to form an easy yet super impressive dessert. 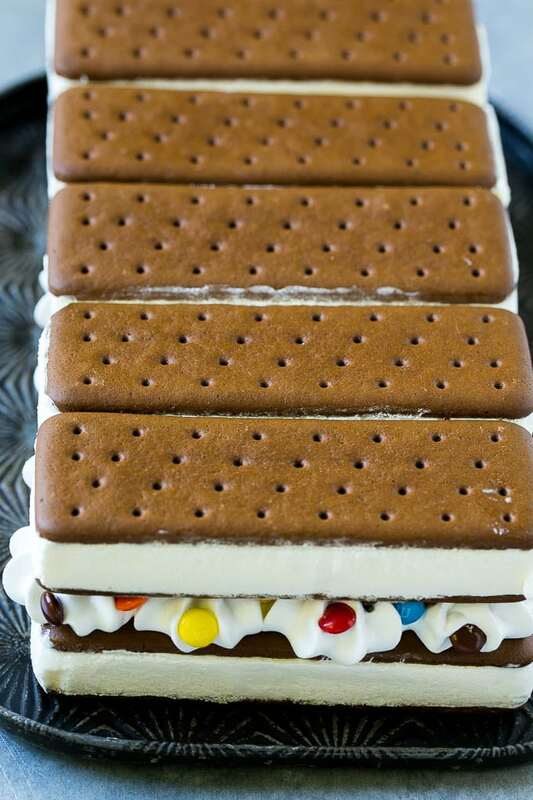 An ice cream sandwich cake is perfect for summer gatherings, birthday parties and school events! Anyone can assemble a fun and festive ice cream sandwich cake. All you need is 5 ingredients to make this unexpected treat that tastes as good as it looks. I have to admit, I’m not much of a baker. I can do your basic cookies and brownies, and I make a pretty decent looking cupcake. But when it comes to cakes, I am WAY out of my league! 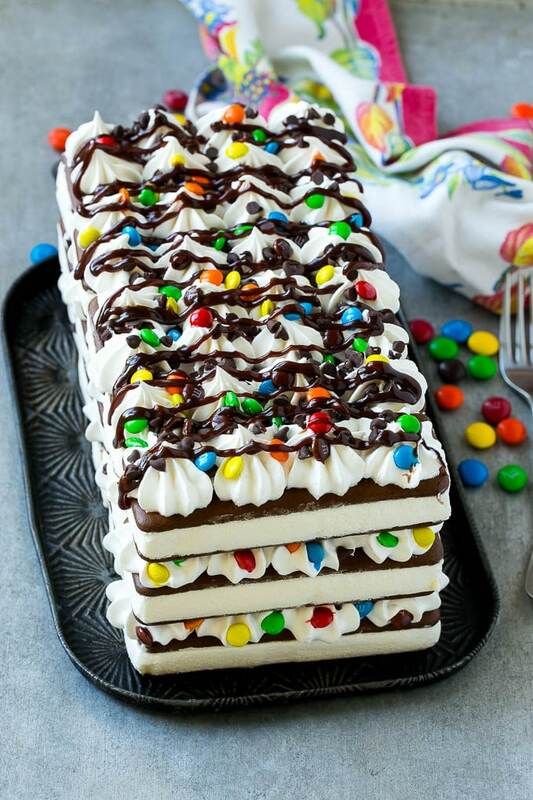 This fun ice cream sandwich cake looks totally impressive, yet can be made by even the most novice cook. I made it for my daughter’s birthday party and it got rave reviews! I use a star shaped piping tip to pipe dollops of whipped topping onto the ice cream sandwiches for a fancier look. You can also just use a spatula to spread the whipped topping if you prefer. I use whipped topping because it’s convenient, but if you’d rather use freshly whipped cream, you can do that too. Just don’t use the kind of whipped cream in an aerosol can, as it will deflate quickly and not hold up to freezing. For best results, you’ll want to freeze each layer before you stack another layer on top. That will ensure that the whipped topping layers stay firm and don’t slide around as you position your sandwiches. It’s a little more time waiting for each layer to freeze, but definitely worth the extra effort. I used chocolate chips and M&M’s in between the sandwich layers, but you can really use any add-ins that you want. Other great options are crushed toffee bars, sprinkles, peanut butter cups or even sundae toppings like caramel. The finishing touches on this cake include a drizzle of fudge and plenty of M&M’s. This cake can be made up to 3 days before you plan to serve it, which is perfect for when you need to plan ahead. You might think that a cake made out of ice cream sandwiches would be boring flavor wise, but let me tell you, that’s far from the case. The sandwiches, combined with the whipped topping, candy and fudge, make this cake taste like the ultimate ice cream sundae. 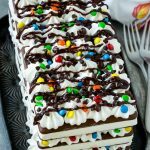 Try this ice cream sandwich cake for your next birthday celebration and watch the rave reviews pour in! Place 4 ice cream sandwiches in a row on a serving plate. Use a piping bag fitted with a large star tip to pipe dollops of whipped topping over the ice cream sandwiches. 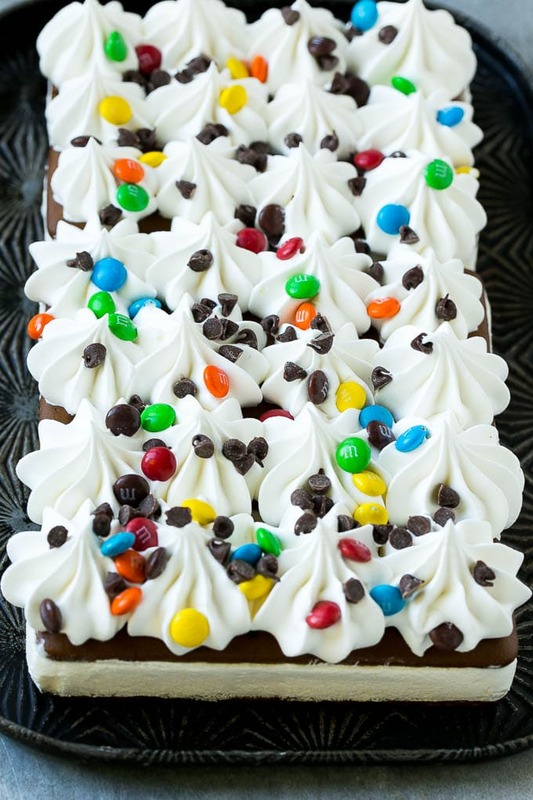 Sprinkle chocolate chips and M&M's over the layer of whipped topping. Repeat the process with the remaining ice cream sandwiches, whipped topping and candies until you have 3 layers of ice cream sandwiches and 3 layers of whipped topping and candies. Freeze each layer until firm before proceeding with the next layer. Freeze the whole cake until firm, at least 1 hour. Drizzle the fudge sauce over the top of the cake. Cut into slices then serve. Cake can be stored in the freezer for up to 3 days before serving. For storage, cover the cake loosely with plastic wrap once cake is completely firm. OMG I need this in my life! Thing is, I’ll try it and it won’t look half as nice as yours. Piping has never been my forte. This was a huge hit at my son’s 4th birthday party! You really have to make sure each layer is frozen before starting the next or the whip cream will soften and smoosh. I did it over 2 days and it turned out wonderful! How can I leave a photo of the cake? Thank you for such a fun recipe! How long did you end up freezing each layer? Did it taste fresh making it two days ahead of time? I frozen each layer for about 45-60 minutes. Yes it tasted fresh just be sure to cover it loosely with plastic wrap after it’s frozen solid to avoid freezer burn. what could be used instead of whipped cream or cool whip? my family doesn’t like whipped topping. You could try marshmallow cream, frosting, or simply drizzle hot fudge and caramel sauces between the layers. This is my kids age 28-37 favorite dessert. My daughter in law doesn’t like true chocolate only “fake”. Haha. I add crumbled Heath bars for a crunch is their favorite but no left overs when other candies used. Perfect for an easy fun summer dessert that would please the whole family! 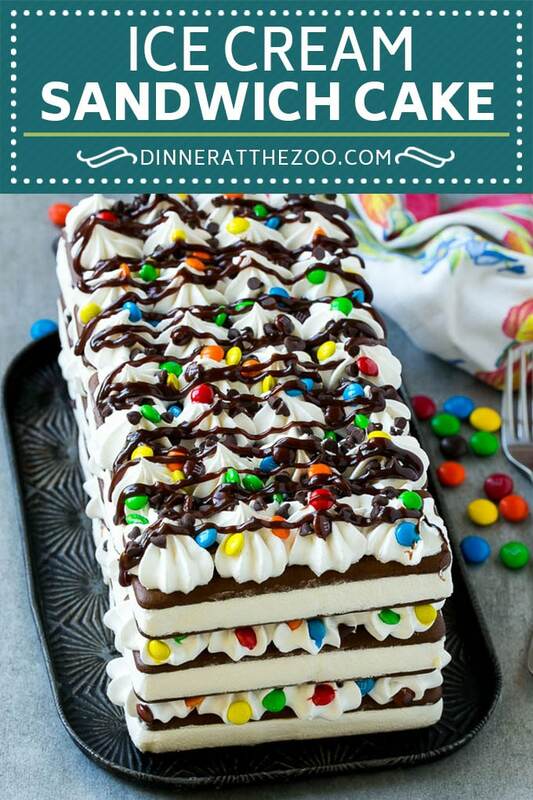 Summer time parties are coming up.. this ice cream cake recipe is what I need! Looks easy enough to make and delicious! Now this is a homemade cake I could make and not mess up! LOL! I need to try this!! What a beautiful cake. I bet it tastes amazing too. I love the detail on the top. 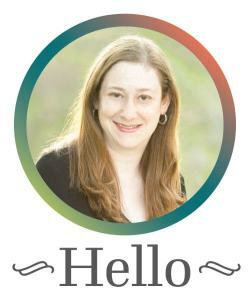 Talk about a fun treat for the summer! It’s perfect for parties and gatherings especially when there are kids. I’m pretty sure they’re going to love it! This is definitely a festive cake. I would love to make it for a celebration. I hope I can cut mine as neatly as you cut yours. Oh my goodness how delicious does this sound – I have to admit I’ve never quite had a cake like this and I definitely need to change that. Wow! This ice cream cake looks like a million bucks. 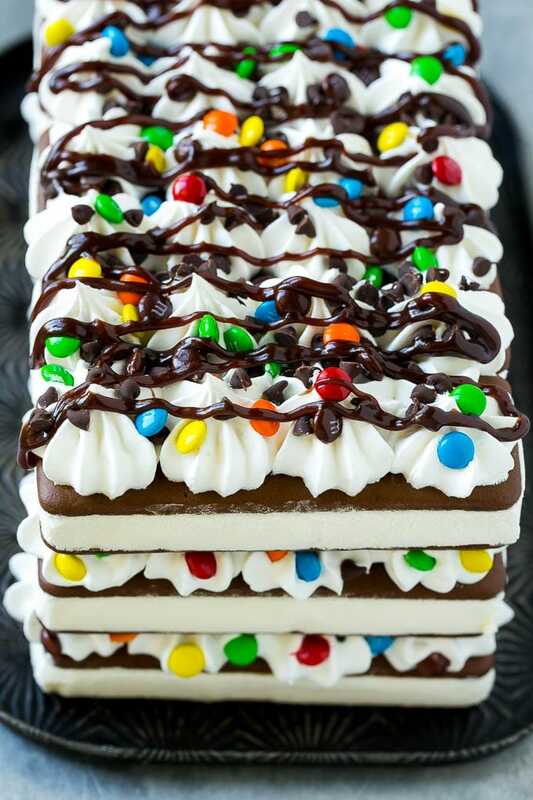 Such a fun idea to use ice cream sandwiches and customize with the toppings you want. My boys would LOVE this! Heck yes! I’ve never had an ice cream sandwich cake. I’m intrigued now. I’ll have to try this out one day. This would be perfect for the summer. I did this for my oldest daughter’s (she is almost 19 now) 10th birthday. I used chopped Reese Cups as opposed to the M&M’s. It was a hit, and super simple to make. Simply doesn’t get any easier to make. 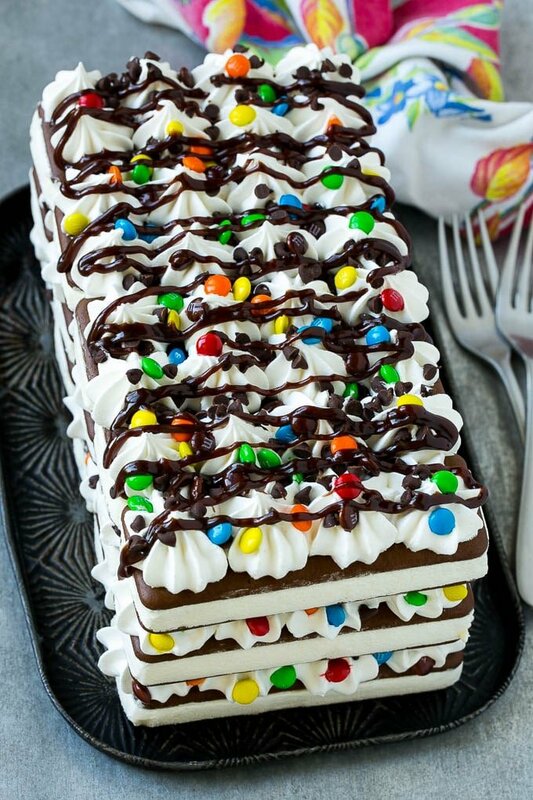 This is the perfect ice cream cake. Anyone can put it together. This recipe looks amazing! I want someone to make it for me. This looks the delicious and so easy to make. I can’t wait to try making this for my family. I’m sure they would love it. I was just thinking about making an ice cream sandwich cake a few days ago. Your cake is gorgeous and would be perfect for my next family gathering. I’m definitely going to use your recipe! I could not possibly love this any more. OMG what a brilliant idea. Can’t wait to make one.